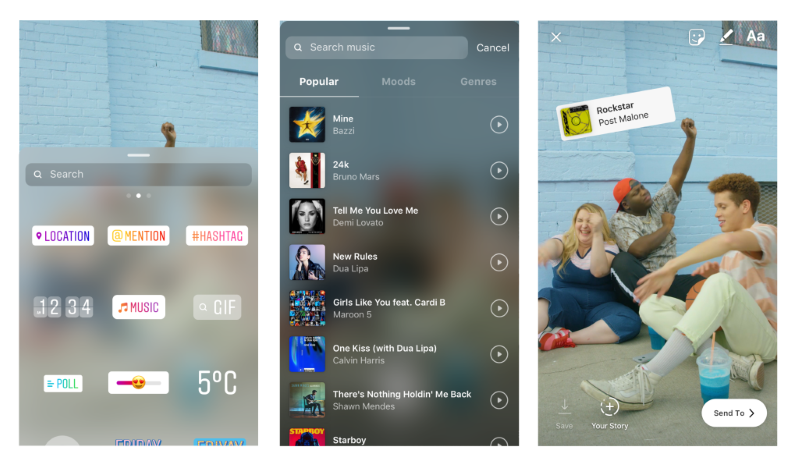 As was rumored in May, Instagram is now letting users add soundtracks to their Stories. Attaching music is as easy as adding a sticker, and folks can choose a backing track to their Stories before or after recording video. When anyone watches them, they’ll hear the song playing and see a sticker showing its title and artist name to discover exactly what they’re jamming to. Selecting a soundtrack to a Story seems easy enough: When tapping to add a sticker to a photo or video, a music icon will pop up. Tap that to bring up a library to search for the perfect song or browse by mood, genre or popularity. Tracks can be previewed before they’re added. Once chosen, you can fast forward or rewind so the tune starts at the moment you choose. Per Instagram’s post, there are thousands of songs to select from with more added every day. Tipsters Ishan Agarwal and Jane Manchun Wong tippedTechCrunch off to a potential music-adding feature hidden in the code of Instagram’s Android version. Combine with Facebook’s licensing deals with Sony, Warner Music, Universal and European publishers, it seemed the company was poised to make a move integrating music into its flagship platform and/or Instagram. You’ll need the latest Instagram version (51) to add music to Stories, and it’s currently only available in select countries. For now, choosing a song before starting a video is available on iOS only, with Android soon to come.